I have knit a lot of socks. 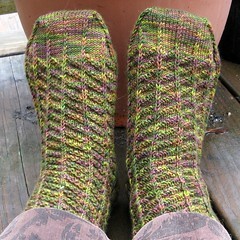 As in, there are 50 pairs of socks on my project page on Ravelry. That’s not even counting socks that were ornaments. A lot of these socks were gifts, but I have kept a couple dozen pairs for myself. 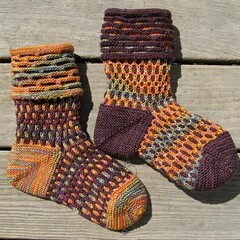 I wear pretty much exclusively hand-knit socks, summer and winter. I put my socks through a LOT — they are worn in hot, sweaty sneakers at outdoor dog agility trials, in boots on snow-tubing trips, and nearly every day in my favorite pair of black leather shoes. About the only abuse they don’t get is being worn alone — even indoors, I usually have slippers on my feet. 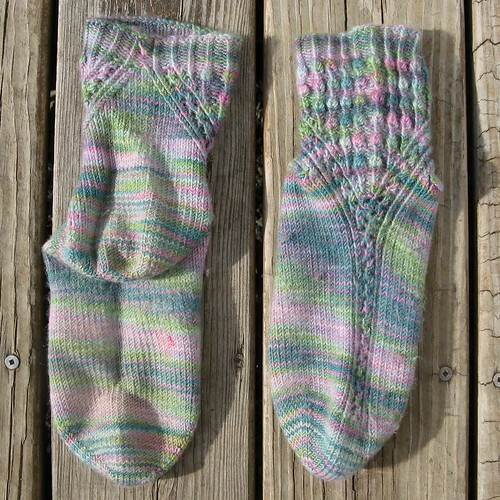 In the beginning, I took sock yarn at it’s word, and I used to machine wash AND dry all my socks with all the rest of the laundry. Eventually I decided that my socks had a hard enough life already, so now my socks get medium hand-knit treatment: I machine wash them in a separate load on the “hand wash” setting (cold water, intermittent agitation), and I hang them on the banister to dry. I’ve noticed that some brands hold up better than others, and I’ve decided to share my thoughts with you, dear reader. 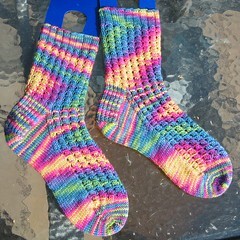 This post will be the first in a series of sock-yarn reviews. I will address the aspects of sock yarn that are meaningful to me: beyond the initial pleasure of creating the socks, how do the socks wear? Propensity to felt, pill, fade, or shrink can ruin a beautiful pair of socks, and I’ve had a few brands become card-board stiff over time. Please allow that this is only my personal, unscientific opinion! All usual disclaimers apply. 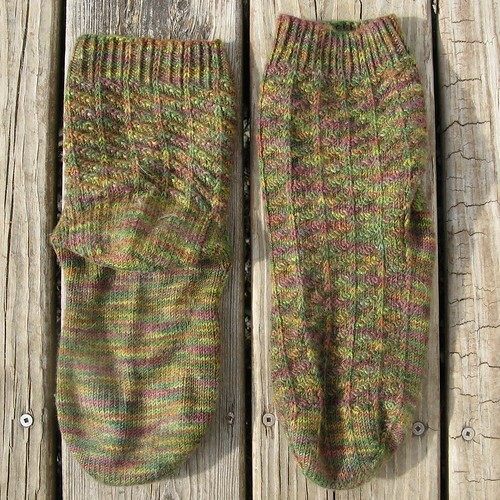 Still soft, mild pilling and felting (toe and heel), mild shrinkage, severe fading. 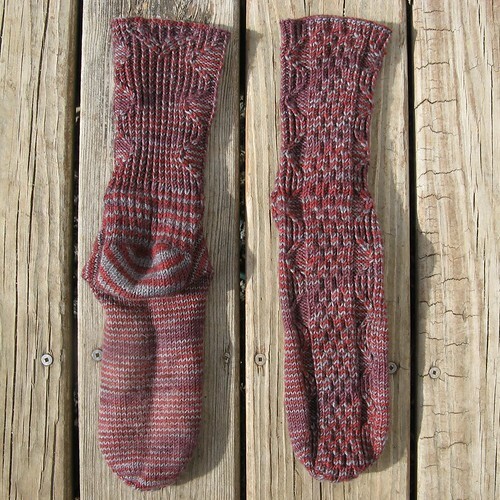 Still soft, mild pilling, moderate felting (toe, heel, sole), mild shrinkage, moderate fading. 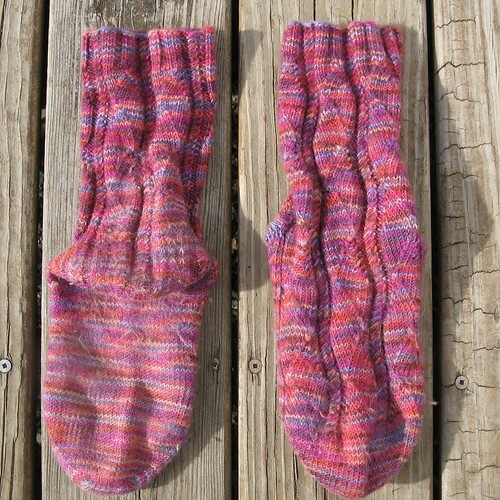 Mostly soft, moderate pilling, moderate felting (toe, heel, sole), no shrinkage, moderate fading. 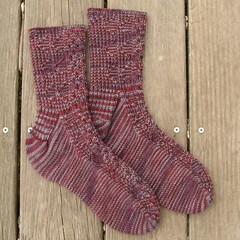 Still soft, mild pilling, moderate felting (toe, heel, sole), no shrinkage, severe fading. 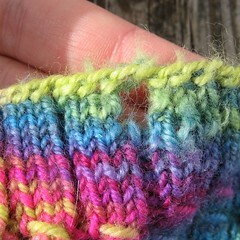 Still soft, mild pilling, mild felting (toe, heel), no shrinkage, mild fading. ALSO — I had to darn a hole in the leg already, and another hole has appeared near the cuff. I think this is a fluke for this particular colorway (possibly even just this skein), as I have never had any trouble with holes/breakage with this yarn before or since. 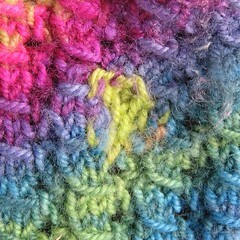 Still soft, mild pilling, mild felting (toe, heel), no shrinkage, mild fading. I will continue to buy STR yarn. I don’t think it holds up well to regular laundry treatment, despite being “superwash.” After I switched to gentler laundering, I no longer had a problem with shrinkage. I expect all my socks to felt a bit at the toes and heel (tennis shoes! summer! ), and pilling a bit is also expected. 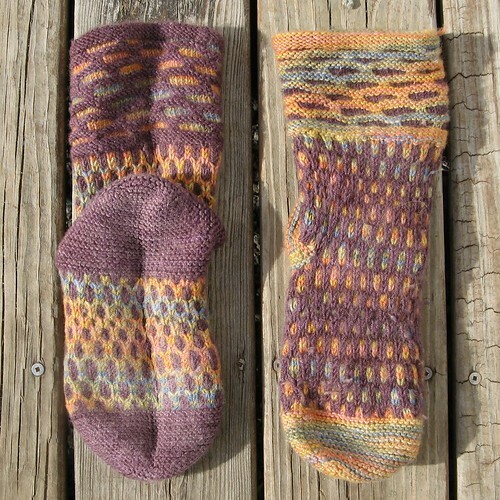 I have been disappointed with how faded some of the socks became — after all, the gorgeous colorways are a big part of the draw for STR yarn. 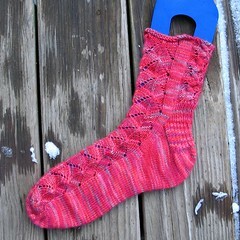 I would be hesitant to buy a lot of red/pink yarn from them (although I still love getting it in the sock club!). I may try a vinegar bath with any future red/pink colorways. My red-hued STR is from so long ago I wonder if the dye-type was changed. But I too have seen STR hold up to ridiculous abuse. I’ve had to darn holes on the balls of the foot in a couple of socks, but that’s it, while other socks have gone the way of the Dodo. Glad to not be alone. So, did yours hold the dye? My newer socks seem to be holding up better (red-dye-wise), but I’m not sure if they are just young, or if the washer/dryer routine played a part in fading the older ones. Also worth noting: the very-purple Jan 2012 yarn from the club was so saturated that it turned my fingers purple. A vinegar bath totally set the color though. I didn’t use vinegar for any of these projects, but after some recent dye issues (Madelinetosh, I’m looking at you! 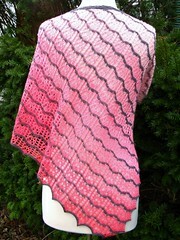 ), I’m seriously considering vinegar rinses on my skeins — before knitting even! You might want to try Dharma’s detergent for dyed fibers. http://www.dharmatrading.com/products/ptd.html It will help yarns to hold dye. Thank you so much for taking the time to write such a detailed review. It is great to see the “then and now” pics. Look forward to reading more! Please teach me about sock yarns. I so appreciate your insight. This is a new area for me. And I cannot tell you how many hours I’ve spent ‘window shopping’ online. But with no idea what I was going to really need. 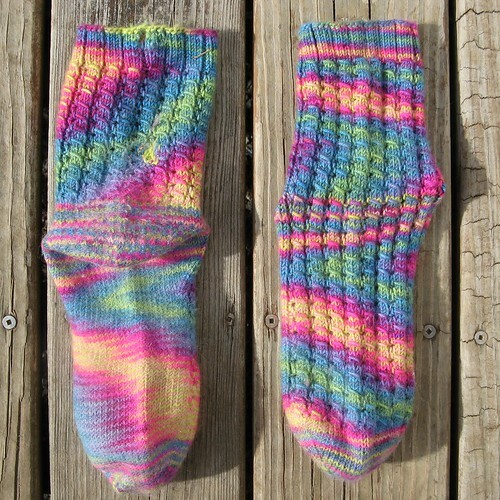 Apparently a bit of nylon helps them to last better than w/o…and a good twist on the yarn. But I cannot tell which ones are tightly twisted or not. There are SO many choices I’ve gotten myself confused…and have get to order any of them. 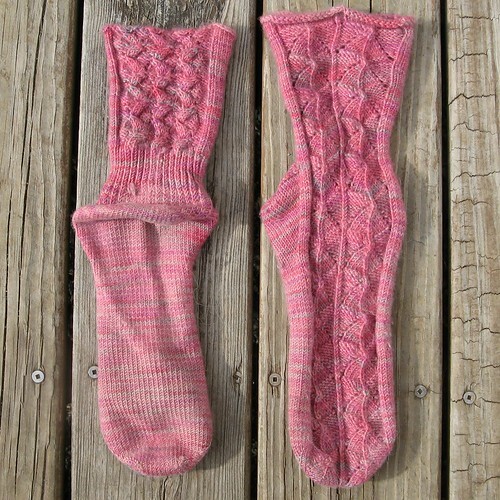 Am in search of 9 sts = 1″ on 2.5 mm / 1 US per my purchased pattern (first attempt at fair isle, or socks). Really, the best way is to dive in and learn by experience! As you say, I’d recommend a nice well-plied yarn, perhaps with a bit of nylon for durability. Beyond that — choose a yarn that speaks to you! Do you have any that you’ve been considering? You can hardly go wrong with Tosh Sock, Socks That Rock, etc. Thank you for the sock yarn reviews; very helpful. I really like the sock patterns, especially the last one. Where are the patterns from?